One large room plus new bathroom. One side has a queen size & double bed (or two twins), dresser, and TV. The other side has kitchen and dining area. 300 square feet. Sleeps up to 4. Three rooms plus new bathroom. One bedroom with queen bed; the other with two double beds. Combination of living room/dining and kitchen. Living area has futon bed. 500 square feet. Sleeps up to 8. 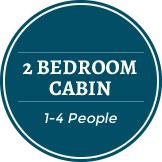 Equal to two small cottages: two new baths, 2 kitchens, two queen size beds, one double bed and twin trundle (two twins), etc. Has pass-through connecting door. Sleeps up to 8. BRAND NEW! 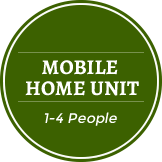 Three bedrooms, 2 baths, large living and dining area, and kitchen. 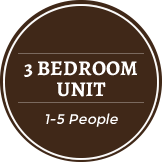 Master bedroom w/ King size bed, 2nd bedroom w/ a queen, 3rd bedroom w/ a full bed. 902 square feet. Sleeps up to 7. Includes 4 rooms plus 2 new bathrooms. Master bedroom w/ queen bed and connecting bathroom. 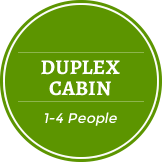 2 separate bedrooms each with twin over queen bunk beds. Combination of living room/dining and kitchen. Living area has futon bed. Sleeps up to 10. Additional people: each cabin rate is based on a certain number of people. Each additional person over 2 years of age is $10.00 per person per night. A Deposit of $225.00 is required upon reserving a cabin. Three night stay minimum in season, two night stay minimum off season. The remaining balance on a reservation is due prior to check-in. A Credit Card number is required for each reservation. We accept VISA, MasterCard, and Discover. We will be open March 1st, 2019, to November 30, 2019! You can book online now for 2019!